"A celebration of old named British bricks"
Last entry: 18.4.2019. Number of bricks currently featured on this website: 5543. 77 letters on a humble firebrick! Got a brick you want the world to know about? I welcome photographic contributions of named, clearly legible, whole bricks which don't currently feature on this website. Size at least 1024 x 768 pixels and ideally with some information about the history of the brick. Images can be emailed to David Kitching at: Old Bricks. UPDATE September 2015: One of my contributors has drawn my attention to the increasing practice of importing bricks from abroad, primarily Pakistan. These can be mainly found in reclamation yards. These bricks are of a very sandy, rough texture and feature random initials. So far identified are A M, B R, D R, G M B, H B W, I M P, L A, L B and Z M A N. As these bricks are neither old nor British I will no longer feature them on this website. Many years ago, I found a house brick with a name on it - nothing unusual about that, you may think, then I found another and I was hooked. On this website can be seen some of the fruits(?) of my labours. 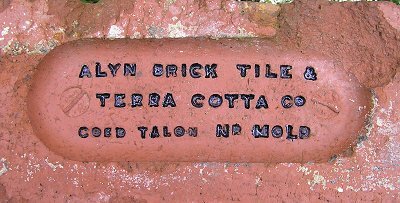 My main interest is in the link that these bricks have to a bygone age and the vast variety of names which are displayed. Many works had only a short lifetime and little of that was ever recorded. When the works closed it was probably demolished immediately and the clay pit filled in, leaving little or no trace, apart - that is - from the name stamped on the brick, which could turn up years later hundreds of miles from its birthplace. A.K.A. Demik, Claire Adams, Mark Annand, Brotherglyn, Derek Barker, Davie Barrass, Carla van Beveren, John Biggs, David Blain, Don Boldison, Margaret Brett, the late Arthur Brickman, Martin Briscoe, Christine Brown, Michaela Brown, Liz Carr, Richard Carr, Ian Castledine, Sarah Chattenton, Ross Chisholm, Andrew Connolly, Richard Cornish, Mark Cranston, Julie Cropper, Alan Davies, Chris Deacon, Steve Dewhirst, Sandra Dillon, Colin Driver, Hamish Fenton, Russell Firth, Eric Flack, Andrew Florey, Simon Fogg, Martyn Fretwell, Nigel Furniss, Terri Gallagher, David Gardner, Tim Geater, Bob Gellatly, Michael Gibson, Graham Hague, Iain Hambling, Michael Hammett, Melanie Harriman, Stephen Hartland, Darren Haywood, Joseph Hodgkiss, Malcolm Holt, Chris Homer, Frank Hunt, Zoe Elzabeth Hunter, Phil Jenkins, Benjamin Jones, Paul Jones, Richard Blacklaw-Jones, Michael Kilner, Steve Kind, David Kitching, Tom Kitching, Jan Latusek, Frank Lawson, Tim Lawton, Henry Lisowski, Nigel Mack, Ray Martin, Richard Matthews, Dan McVey, Antony Meadows, Nigel Megson, Lynn Mills, Guy Morgan, Colin Mouser, Brian Murless, Alan Murray-Rust, Bob Osborn, Richard Paterson, Simon Patterson, Beverley Pearson, John Pease, Ken Perkins, Darrell Prest, Neil Ramsden, David Redd, Gryff Rees, Phillip Rothery, Michael Raybould, Liz Robinson, George Rutherford, Nick Savage, Chris Shaw, Mike Shaw, George Simpson, Ian Sinclair, Mike Stokes, Lawrence Skuse, Vladimir Smirnov, Alwyn Sparrow, Edith and Andrew Stewart, Jason Stott, Ian Suddaby, Barbara Sutcliffe, Ian Sutton, Richard Symonds, Iain Taylor, Gareth Thomas, Richard Thorpe, Chris Tilney, David Ward, Rachel Wheatley. The website is intended to be lightweight with an emphasis on variety. It's not an academic exercise intended to cover each and every works and design of brick. There is no database or master index. Primarily it is a celebration of names and should be treated as such. 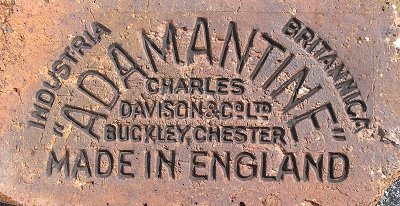 British bricks were exported all over the world and there are entries on the site from Chilean Patagonia, the Adriatic, Sri Lanka and St Petersburg. The site also features some photos of named bricks made in Australia, Belgium, Brazil, China, France, Holland, Hungary, Ireland, Russia, the U.S.A. and the French penal colonies in South America. Many of the photos were taken in situ which accounts for the lack of clarity in some of the images. Because of David Sallery's location in North Wales there is a separate section for locally produced ones. The Buckley and Ruabon areas were by far the most important and these web pages reflect this. I have so far only recorded a tiny percentage of those produced and have barely scratched the surface (pun intended!) of what might still be available. As the pace of change accelerates, these humble reminders of a forgotten past are disappearing at an ever increasing pace - so grab them while you can! One important plus point - old bricks are free, one important minus point - very few of the bricks you find will be name stamped. Happy hunting! A glazed brick discovered during renovation work at Carnforth station.